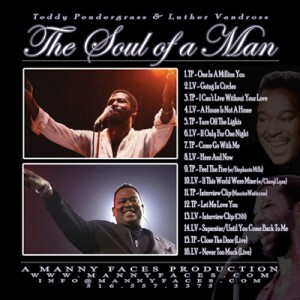 I'm already downloading and could not pass up the opportunity to share "Manny Faces Presents: The Soul of a Man – Teddy Pendergrass & Luther Vandross" mixtape. "Featuring the best of two of the finest soul/R&B singers in recent memory, a compendium of songs that you can play start to finish, giving you and your loved one plenty of background music to, well, start and finish, if you know what I mean (devlish wink). Disclosure: We take no responsibility for any children born as a result of this mixtape. Unless they are awesome. I'm ready to enjoy, just not sure about baby making as yet. LOL! As for you ... just thank me later! love it too! just wish there was alot less interuption/talking!